The first thing that comes to mind when you think about sliding doors that they’ll help bring a lot of light into your home. If you’re replacing a solid door and adding a sliding door then this door replacement is going to bring a drastic change in the amount of sunlight that’ll come in your home. Sliding doors are absolutely perfect for adding lights to interior spaces. The light adds to the beauty of your home architecture, furniture and the overall look of your home. Sliding doors give a better view of your yard or deck. If you are looking to create that perfect green scenic view from your living room then sliding doors will help you do just that! The large glass planes on sliding doors will help achieve that view that you are looking for. You can sit in a controlled environment of your family room and will be able to enjoy the outside. Whichever weather it may be you’ll be able to view it from your interior space without being exposed to the elements. Lastly sliding doors are best at managing space. This feature is usually overlooked at first because it’s more of a function than a visual feature. You can have furniture; potted plants or other decorative objects in the way when you have that one door to work with but when you are working with sliding doors you definitely will be saving a lot of space. These objects will not make a difference. At Pioneer windows and doors we will give you so many other reasons why you should opt for sliding doors with double and triple pane glass that is not only energy efficient but also if you build them with heavy-duty vinyl frames they’ll last you a long time. 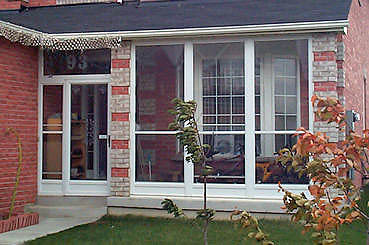 We at Pioneer understand doors and windows are big investment they are only done once. We make your investment counts and you get the doors that you are looking for. They doors should complement your home and are durable as well as easy to maintain. If you have any questions you can speak to our professional for more details on the variety of doors that are offered. You can also visit our website to see which door works best for you. Let us know if you need help with anything!